While much maritime press focuses on ‘autonomy’ and within minutes. They found conventional rust inhibitors be applied to blasted surfaces, preserving the blast and ‘digitalization,’ every vessel owner will attest that the to be “? lm-forming,” meaning they were effective in preventing ? ash rust and corrosion for up to one year. 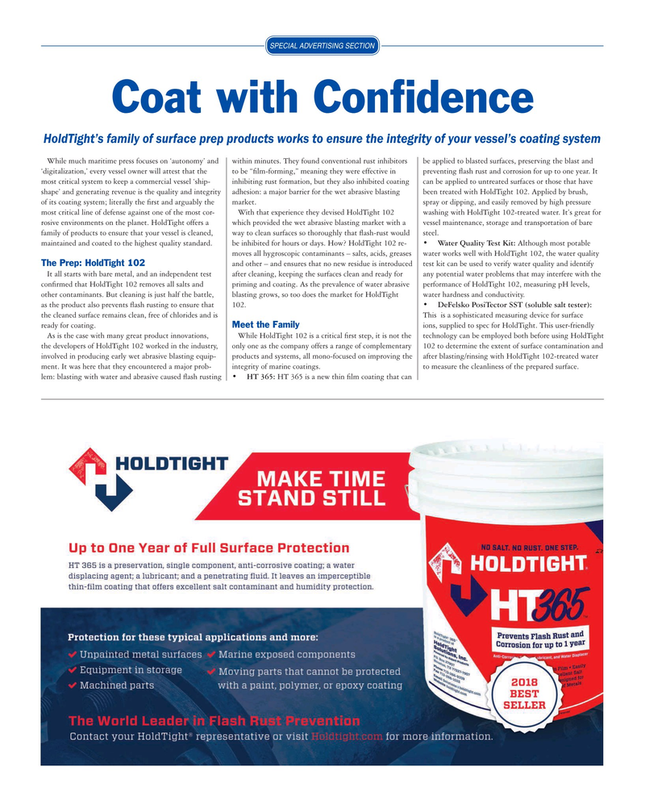 It most critical system to keep a commercial vessel ‘ship- inhibiting rust formation, but they also inhibited coating can be applied to untreated surfaces or those that have shape’ and generating revenue is the quality and integrity adhesion: a major barrier for the wet abrasive blasting been treated with HoldTight 102. Applied by brush, of its coating system; literally the ? rst and arguably the market. spray or dipping, and easily removed by high pressure most critical line of defense against one of the most cor- With that experience they devised HoldTight 102 washing with HoldTight 102-treated water. It’s great for rosive environments on the planet. HoldTight offers a which provided the wet abrasive blasting market with a vessel maintenance, storage and transportation of bare family of products to ensure that your vessel is cleaned, way to clean surfaces so thoroughly that ? ash-rust would steel.